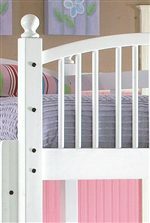 This functional and pretty bed offers great organization to a youth bedroom. 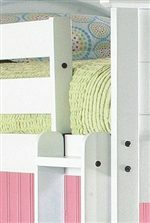 The bookcase headboard includes 3 open cubbies above with one cubby below in addition to a top surface to use as an additional shelf for decorations and frequently used items. 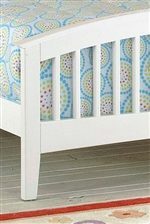 The underbed drawer bases offer eight drawers, four drawers per side of the bed for clothing, toys, linens, and more. The slat footboard completes the look. This bed is available in twin and full sizes. The Bayfront Full Dual Storage Captain's Bed by New Classic at Beck's Furniture in the Sacramento, Rancho Cordova, Roseville, California area. Product availability may vary. Contact us for the most current availability on this product. 1415-427 Footboard 1 60.5" 2" 30"
1415-437 Rails and Slats 1 1" 75" 5"
1415-098 Drawer Base 2 74.5" 20" 20"
1415-417 Headboard 1 60.5" 10" 52"